It’s here! ACFW 2012! Watch out for our Alleycats who will be LIVE BLOGGING from Dallas as conference kicks off. So many hopes and expectations converge over these next few days. Let’s pray that God will be at the center of it all. For those who are travelling… Lord, keep them safe. We ask for itineraries to run smoothly, for timely flight connections, for safety on the road, for time to reflect and relax and mentally prepare. For those who are anxious… Lord, give them peace. In all the hurry and busyness, let them turn their minds to you and find a place of calm. Take away all anxiety and worry, pressure and expectation, and fear of the unknown. Replace these things with your perfect peace. May they rest in you. For those attending conference for the first time… Lord, may they have the time of their lives. We pray for new friendships to be formed, for eyes and ears wide open to soak everything in, for hearts willing to learn and the confidence to go after their dreams. For those who’ve been before… We thank you for friends old and new, for fun and laughter, for morning coffee-runs and conversations that last late into the night. We ask for eyes to see those who are lonely or in need of encouragement, and the generosity of spirit to reach out beyond themselves and help someone else along the way. For writers who are feeling burnt out… Lord, give them fresh inspiration. Fresh ideas. Fresh joy in the craft and a renewed passion for their calling. You know those who need a little extra something this year. Those who’ve pursued their dreams for so long they’ve grown tired and discouraged along the way. Please bless them with a song in Praise and Worship, a light-bulb moment in a workshop, a word of encouragement from a respected mentor, the divine connection they so desperately need, the open door they’ve been longing for. For writers who are pitching… Lord, please gift them with peace and clarity. Help them articulate the essence of their story with passion and heart. Give them the confidence to believe in their ideas and the grace to understand that not every editor or agent will be a perfect fit for them. We pray for a spirit of calm over the appointment tables, for great conversations between writers and industry professionals, for writers to leave their appointments feeling satisfied that they represented themselves well. For the editors and agents… This is such a busy time for them. Amid the clamor of voices, pitches and ideas, please give them the discernment to recognize the people and projects that would be a great fit for them. Keep them sharp and alert to what your Spirit is saying. Give them the ability to filter through distraction – a noisy lunch table, an imperfect pitch from a nervous writer – and catch the heart of each idea that is offered. May they consider each project with open-mindedness, honesty and grace. When they are tired, please refresh their spirits. 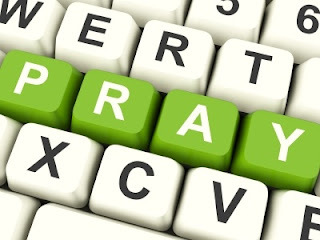 We pray for blessed times with colleagues, valuable professional connections, and exciting new projects to acquire. For those who can’t go to conference… Lord, help us to trust in your good plans for our writing journey. Renew our spirits. As we hear good news and exciting stories filtering back from our writer friends at conference, may we rejoice with them whole-heartedly. We thank you for how far you’ve brought us and give you praise that the best is yet to come. How can we pray for you this week? Please share your prayer requests in the comments section so we can lift each other up in faith! What a beautiful prayer to fortify our hearts this week! Thank you! I think today is one of the tougher days. I've been fine with not going but as people post, I see all the writers that I'm not going to meet this year. One of the things that I didn't realize when I went to the conference was how deeply the presence of God was there among us. It wasn't just about writing, it was about fellowship. The prayers going toward that meeting seem to hang overhead and I was so blessed by that aspect of the conference. Awesome prayer, Karen! Thank you! Much needed! You're so welcome, Julia. Have a wonderful, blessed time!! Thank you for those beautiful prayers! You captured perfectly each aspect of the conference that needed prayer with the perfect words! As for me, if anyone feels inclined, I'd be very grateful for prayers! I'm feeling a bit overwhelmed tackling a large edit (requested by an editor who has shown an interest in my story!). Please pray that I receive the insight and guidance to do the edits required with skill and grace. Thanks guys! Good luck to everyone attending the conference. Will be eager for tidbits of news as posted! LOVE all these prayers, Karen. Would LOVE prayer that I not get snappy and grumbly cuz I'm not there. Sue, what an exciting opportunity! Praying!